What is Visual Catpro ? Visual Catpro is an integrated business accounting software for small and medium businesses. With over 5,000 installations (over 20 thousand users) in India and abroad. 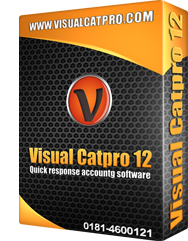 Visual Catpro is one of the leading accounting software in Punjab. It provides businesses the tools necessary to streamline business processes, make transactions manageable, and improve employee efficiency and accuracy. 1Financial accounting upto balance sheet. 2Fully automatic vat returns with error reporting. 3Customizable billing system fully integrated with accounts / vat.